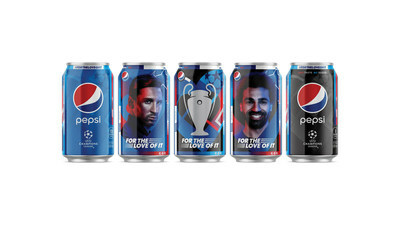 PURCHASE, New York, Feb. 12, 2019 /PRNewswire/ — #FORTHELOVEOFIT – Today, Pepsi® premieres its 2019 global football campaign under the brand’s new international platform and tagline, PEPSI, FOR THE LOVE OF IT. Encouraging people to go all in for the things they love, FOR THE LOVE OF IT is brought to life through the brand’s passion of football – which has been at the heart of Pepsi for decades. Across the brand’s trademark, this year’s campaign celebrates the brand’s ongoing partnership with the UEFA Champions League, with two of the world’s best footballers together for the first time, facing off in true entertaining Pepsi style. PepsiCo products are enjoyed by consumers one billion times a day in more than 200 countries and territories around the world. PepsiCo generated approximately $63 billion in net revenue in 2017, driven by a complementary food and beverage portfolio that includes Frito-Lay, Gatorade, Pepsi-Cola, Quaker, and Tropicana. PepsiCo’s product portfolio includes a wide range of enjoyable foods and beverages, including 22 brands that generate more than $1 billion each in estimated annual retail sales.